System Center Configuration Manager 2012 PXE Boot Installation 1. Make sure you have installed the Windows Deployment Services (WDS) role on your SCCM 2012 Server (no seperate PXE role anymore) 2. 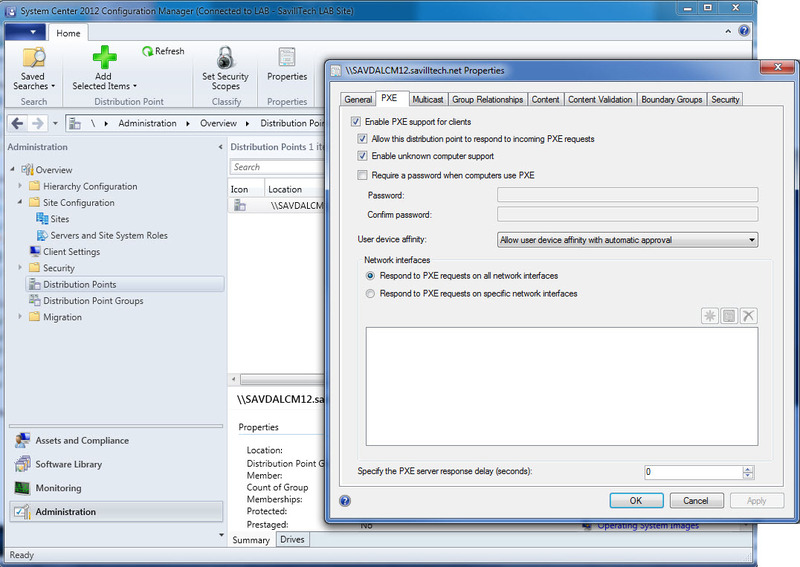 Activate PXE-Support at Distribution Point Config @ Site Roles 3. Make sure the x86 and x64 boot Images are distributed to the PXE-enabled Distribution Point. In the properties of the boot Image, under Data Source, makre sure the check box labeled „Deploy this boot Image from the PXE Service Point“ is selected 4. 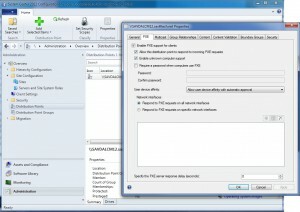 Create a task sequence and distribute it, making sure it’s configured as Make available to boot media and PXE. If machines can’t boot via PXE, open up the SMSPXE.LOG file in the CMTrace.exe tool on the SCCM PXE, and look for Problems.